Unique and prestigious event in the Ukrainian American community with international media exposure. The show was widely featured in the media, including TV, radio, print, and online, accessible to a large Ukrainian audience worldwide. Ukrainian women are arguably the most beautiful in the world and perhaps the most talented. They shine from the stage in Chicago. The event showcases Ukrainian music, dance, language, and art. It is a talent show combined with a concert of the best Ukrainian performers. 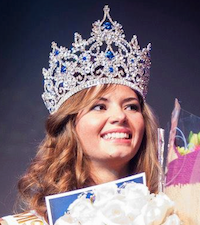 Miss Ukrainian Diaspora aims to preserve and popularize Ukrainian cultural heritage throughout the world and to support the Ukrainian community of Chicago. The most famous singers and musicians arrive from Ukraine to perform at the show. In 2012, Oleksandr Ponomaryov, the Golden Voice of Ukraine, was our guest performer. In 2013, the show featured breathtaking performances by the World Music Award & Eurovision winner, Ruslana, and world’s famous violin virtuoso, Vasyl Popadiuk. Ukrainian Queen of Pop Music, Iryna Bilyk, performed in 2014 and a popular Ukrainian comedian, Michael Schur, hosted the event. The 2015 show will feature a concert by top Ukrainian singer, Zlata Ognevich, and a fashion show by Oksana Polonets. Each event is produced at a concert hall type venue to ensure best quality of sound and show lighting. Unique advertising opportunity in the Ukrainian community. Local, national, and global target markets. I am a proud Ukrainian striving to promote our Ukrainian heritage here, in the Unites States. I’m fostering our beautiful, rich traditions and culture. I will always remain a Ukrainian no mater where I live. My beloved Motherland Ukraine is always deep in my heart and I encourage all Ukrainians living in the Diaspora to never forget who they are and to be truly very proud of their Ukrainian heritage.